Big historic home with four bedrooms and modern updates. Ready for you! We've got you covered with swanky new mid-century furnishings, shiny new appliances and brand new front loading washer and dryer. Enjoy fresh coffee at the new coffee bar for that morning cup of joe. You can enjoy your coffee or tea on the front porch, kitchen or backyard courtyard. We've got you covered with Ultra HD Smart TV in the living area, high speed WIFI, local channels and free Netflix. There is a small desk with office supplies by the kitchen for after hours work. Plaza Place is equipped with an iron, ironing board, hangers and plenty of detergent for laundry. Did we mention it is mostly all new? We also have a few games, hair dryer, bottled water & more! Also, enjoy free private parking through the gate and behind the house. The entire property is yours to enjoy. Self check-in is easy with push button combo lock. Front porch faces north and is complete with a couple of lawn chairs for relaxing. 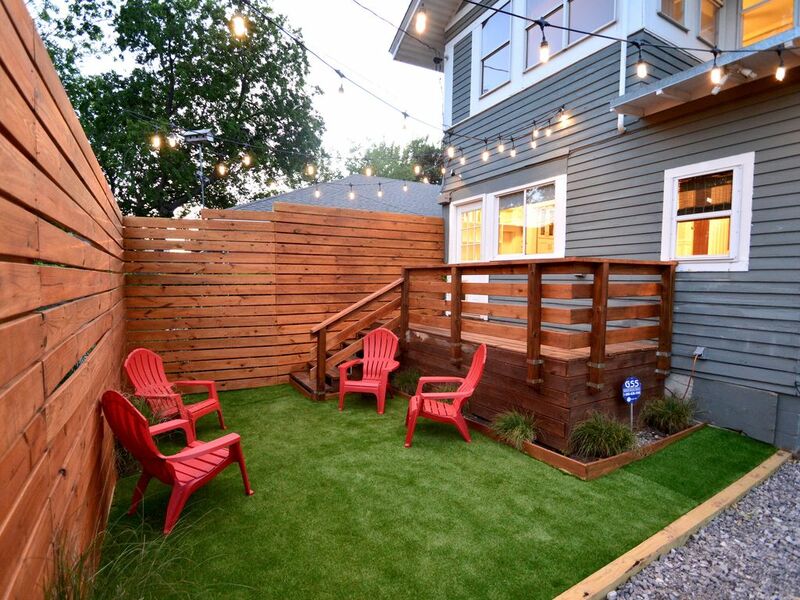 The back yard has a newly finished deck and courtyard area, perfect for unwinding after adventures. Complete with brand new gas grill. There are four total bedrooms. The 2nd floor has a bedroom with a king, a bedroom with a queen and another bedroom with a queen. The 4th bedroom is located on the 3rd floor and has four twin beds. The two full bathrooms (one downstairs by the kitchen and one one the 2nd floor by the bedrooms) are complete with body bars, shampoo and conditioner. 2nd floor bath has a full size tub and separate shower. Also, we have toothpaste with extra toothbrushes and supplies including a hair dryer and more. Enjoy the 4k Ultra HD Flatscreen Smart TV in the living room with local channels and free Netflix & YouTube. High speed WIFI is available (2 different options for guests) and a work desk is complete with office supplies. The kitchen should have every thing you need to prepare a basic meal. Gas cooking and microwave available. Base rate is for four people. A small nightly fee will be added to quote for total over 4 people and will be automatically calculated into your reservation request. We love hosting people and are excited to offer a five homes in the Oklahoma City area: Rosemary Place (up to 6): https://www.vrbo.com/1001924 Aurora Place (up to 8): https://www.vrbo.com/1242122 The Urban Farm (up to 8): https://www.vrbo.com/1251732 Plaza Place (up to 10): https://www.vrbo.com/1079229 Clean & Simple Home (up to 6): https://www.vrbo.com/1391099 We have everything set up for a great stay and are having success so far. We've been in the OKC/Edmond area for 5+ years and love family, kids, working out and trying to stay young, traveling and helping people. Please check out the reviews on this special historic home. You'll love it! So close to the Plaza with tons of shops and restaurants within a 60 second walk! Our family celebrated Christmas in this historic home and had a wonderful time. So much better than staying in separate hotel rooms! We had plenty of space and separate bedrooms and a large and very pretty family room to spend time together. We ate and played games at the large dining room table and cooked our Christmas meals in the modern kitchen. We walked to Aurora’s for breakfast and walked to the Pritchard, Oak & Ore, and the Anatomy wine club. Perfect! House was in a central hip location. The house was great but it would have been nice to have a second TV when you have multiple people in the house. Thanks for the visit. Fantastic home very close to downtown! Very thoughtful owners who truly care about your experience. This is a beautiful older home very close to downtown which makes business a breeze. We thoroughly enjoyed our stay in this beautiful home. It is pristine, yet homey,; very comfortable and extremely charming! It's central location is convenient to everything we wanted to see and do. Chad and Macy are the consummate hosts. Definitely recommend this place! Beautifully updated home with old charm characteristics left in place. Perfect for a stay in OKC. Please respect our property & the agreed upon house rules: Absolutely NO smoking or vaping, PETS or animals of any kind. Quiet hours for neighbors are 10:00pm to 7am. Please no house guests unless registered when booking, no parties or large gatherings. This is not a party house. Thanks for helping us keep our place in great shape for future guests! If you need to add additional guests after your original booking, please let hosts know. A small nightly fee for each guest will be added to your reservation. Must climb stairs - 3 bedrooms are on the 2nd floor (one w/ king bed, two w/ queens). There is a bonus room/4th bedroom on the 3rd floor w/ four twin beds. The main bathroom is on the 2nd floor next to the bedrooms. The second full bath is on the 1st floor next to the kitchen. This is a historic home and the stairs are steep and somewhat loud to walk on. Guests should be mindful and careful on property, particularly if there are small children. Guests agree that owner will not be responsible for any injury on stairs or elsewhere on property for any reason and agrees to use property at their own risk. There are security cameras around the exterior of the home. We do not have cameras inside the home to respect our guests privacy. Hope you enjoy your stay at Plaza Place!